The Orono Land Trust exists to protect and preserve our natural environment. Every membership and donation helps to keep Orono areas green and connected through their trail systems. Membership is open to all those who wish to belong. Join our efforts to conserve the special places in Orono & surrounding communities and maintain trails for use by the public. Please note: You DO NOT need to have a PayPal account to use this service. Just select “Pay with a debit or credit card” on the checkout page. During checkout you may add a note if there is a specific location where you would like to see your donation applied. If you care about the future of open space within Orono & surrounding communities, please join us. Orono Land Trust is a publicly supported charitable organization 501(c)3. 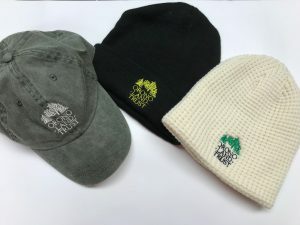 You can also support OLT’s mission buy wearing out hat!